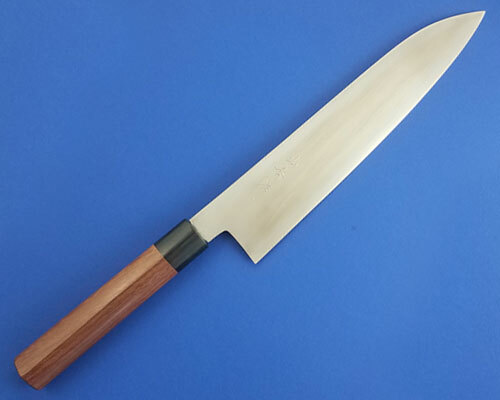 Homurra knives are crafted by top Minonokuni blacksmiths. This hand forged Gyuto or Chef Knife made exclusively for Knife Merchant really shows the benefits of a hand made knife. This is a double beveled blade, hand forged using Blue Steel and jacketed with a layer of tough durable stainless steel. The ferrule is made of Blackwood and a handle made of Sandalwood. Made in Japan. 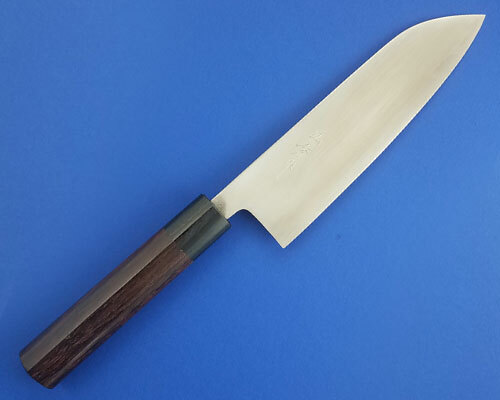 Homurra knives are crafted by top Minonokuni blacksmiths. This hand forged Petty or utility knife made exclusively for Knife Merchant really shows the benefits of a hand made knife. This is a double beveled blade, hand forged using Blue Steel and jacketed with a layer of tough durable stainless steel. The ferrule is made of Blackwood and a handle made of Sandalwood. Made in Japan.